Ease into relaxation in your Novotel Deluxe room after an exciting day exploring the shops and sights of Singapore. Clean contemporary lines and muted colours create a tranquil feel, and 23m2 (247 sq ft) of space let you stretch out in comfort. High-speed Wi-Fi and an ergonomic desk let you work effectively. When it’s time to unwind after an energising workout, help yourself to a drink from your minibar. 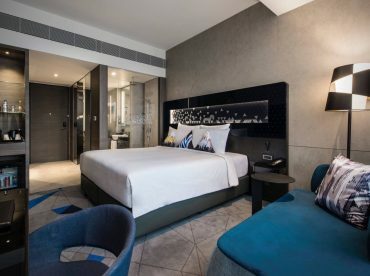 A choice of a luxurious double or two twin Novotel beds promises a restful night’s slumber. Complimentary parking is also available for all in-house guests.